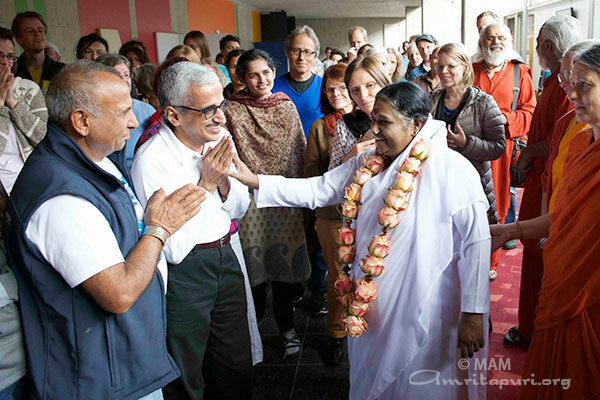 The actual fact is Mata Amritanandamayi Mission (MA Mission) was an organisation formed before the existence of Mata Amritanandamayi Math (MA Math). After forming MA Math, the MA Mission was dissolved and merged with MA Math and the fact has been communicated to the Home Ministry many times. Please see a copy of the letter dated 16th June 1999 (download the pdf) sent to the Home Ministry. Now Math has approached the Ministry and the Ministry has agreed to remove the name within a week. 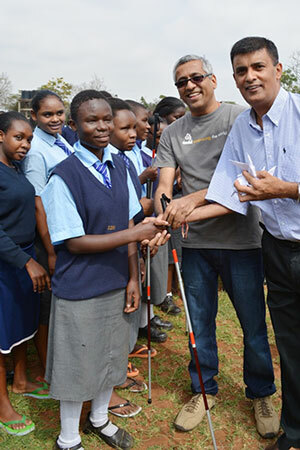 On behalf of Embracing the World, Mr. Nagesh Karuturi, chairman of MAM Charitable Trust, Kenya, is handing over the first canes to students of Thika school for the visually impaired, Kenya. 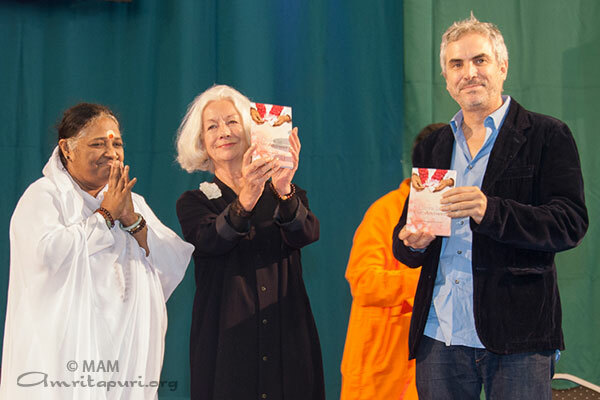 On the occasion of Amma’s 61st birthday, Embracing the World and AYUDH Kenya volunteers handed over the first set of canes to blind youth at Thika school, Kenya. The visually-impaired school has a mixture of students who have varying degree of vision loss, from albino children with photosensitive eyes to completely blind children. 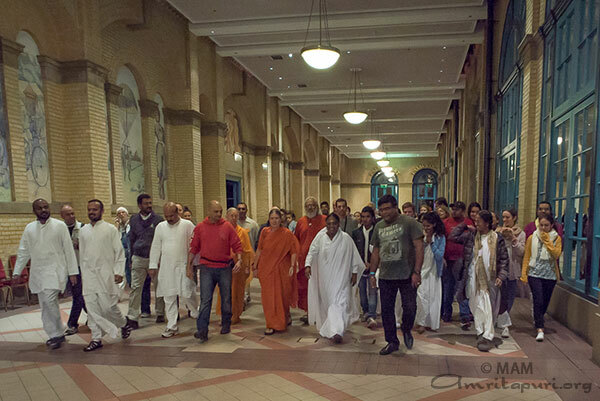 Yet, not a single one of them had owned a cane, which can make life much significantly easier for a blind person. Upon receiving the canes, the entire children body did a big “thank you” jig by clapping, clicking and stamping the floor in succession. 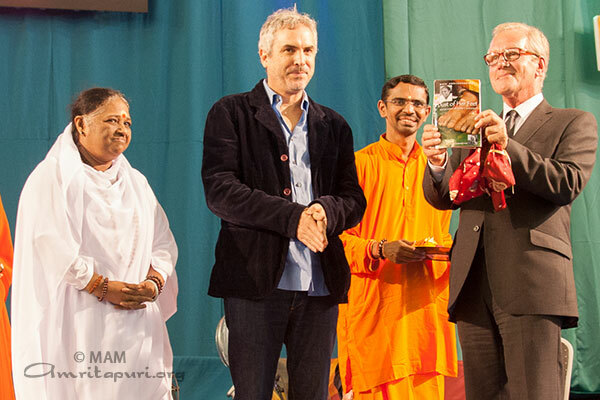 Two girls came forward, and one of them thanked AYUDH and the good work being done by the White C(r)ane project, while the second girl recited a beautiful prayer. 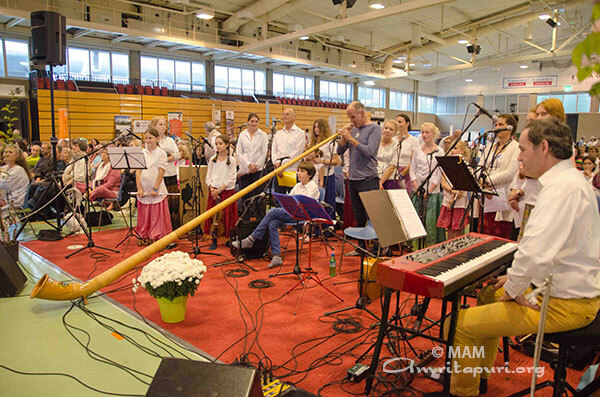 AYUDH promised them to be back with more canes in the near future and to make sure that every child who needs a white cane in the school gets it. AYUDH has already collected funds for a total of 300 canes and is currently looking into finding the right sizes and models matching the needs of children and youth in Kenya. 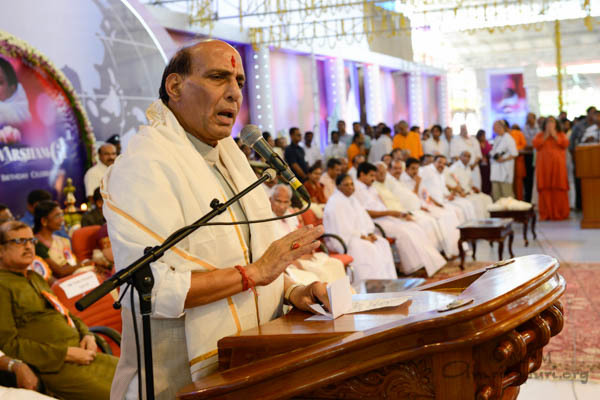 Union Home Minister Rajnath Singh applauded the spiritual guidance and humanitarian initiatives of Mata Amritanandamayi Devi as her charitable trust announced a Rs 25 crore relief and rehabilitation package for victims of the devastating floods in Jammu and Kashmir. 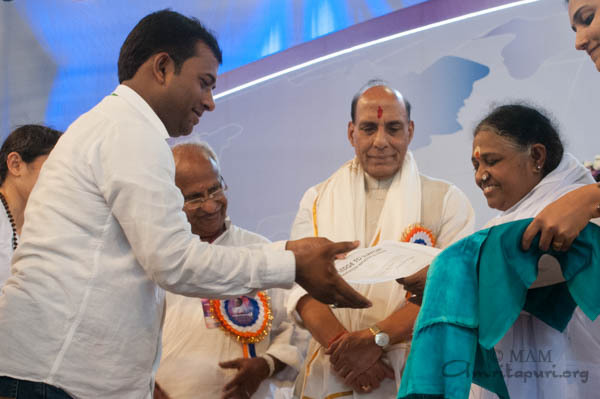 The Minister who arrived here on Saturday to take part in Amma’s 61st birthday celebrations also formally handed over the keys of the houses that the Mata Amritanandamyi Math has constructed in Rudraprayag, Uttarakhand, for 250 families that lost their homes in the flash floods in June 2013. 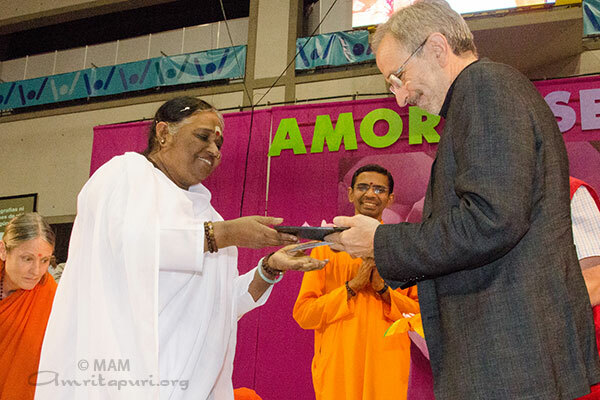 Speaking on the occassion he said: “I feel very blessed today to have received an opportunity to meet Sri Mata Amritanandamayi Devi. 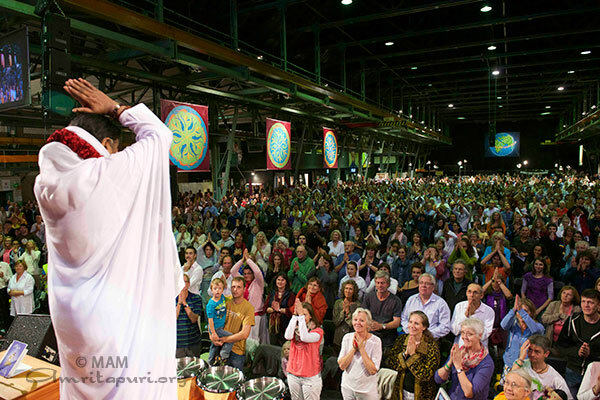 To be honest, I am here today only for receiving Darshan from Amma and not to give a speech. 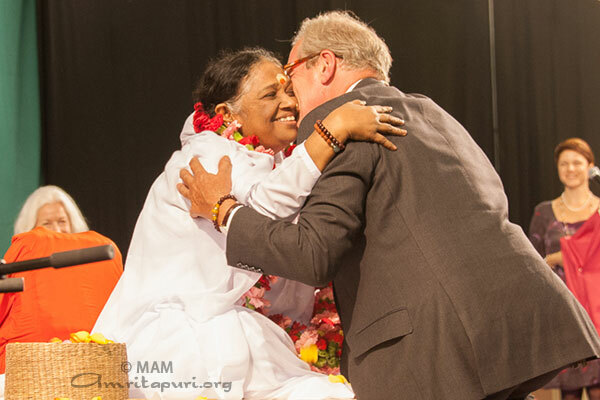 “Mata Amritanandamayi Devi is a definitely a spiritual power within whom manifests the Ocean of Love, Compassion and Forgiveness. 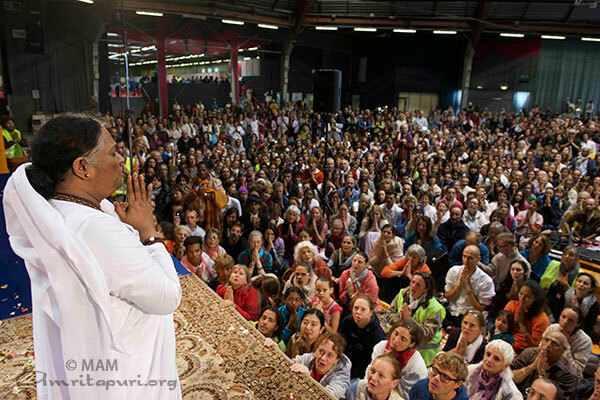 I personally believe that the solution to all problems of this country, the earth and the entire universe is only possible through Love, Compassion and Forgiveness. These qualities will never arise in a person who is narrow minded and closed in heart but will definitely arise in a person who is broad minded and who has a very open heart. 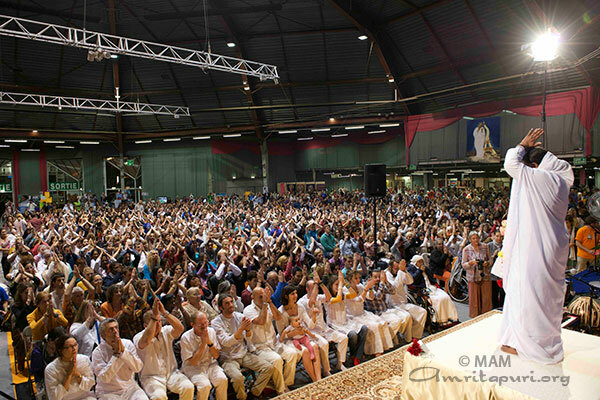 Only such a person will achieve happiness, joy, bliss and even immortality. 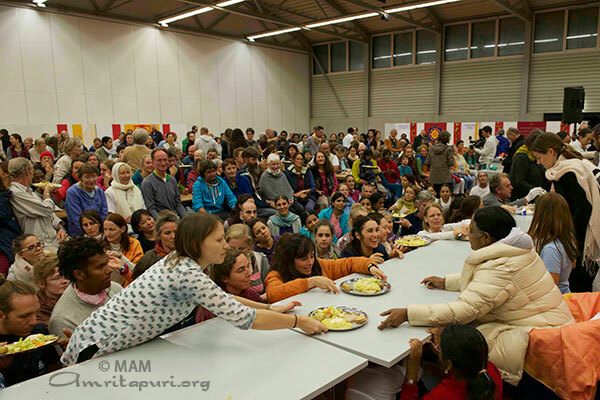 “Our Mother — Mata Amritanandamayi Devi, is so broad minded and so full of love that she not only has concerns for the entire humanity but also for all of the living beings such as animals, birds and even insects in this world. 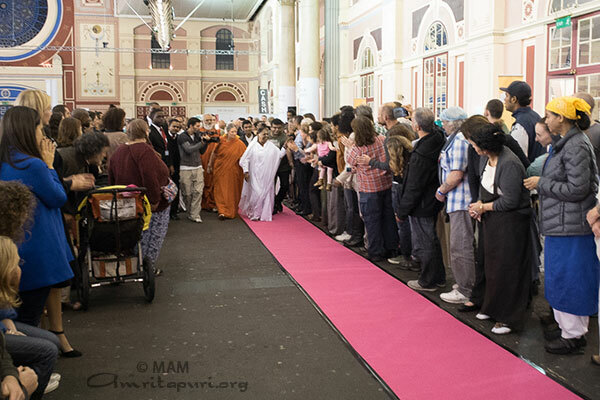 If at all there is a Mother of the universe, then it definitely is none other than Mata Amritanadamayi Deviji. 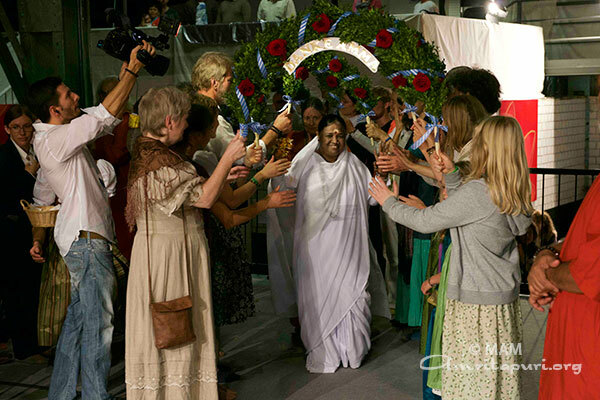 “Do you know why I call her the Divine Mother? It’s because when she was just 6 months of age, she began to walk and talk. 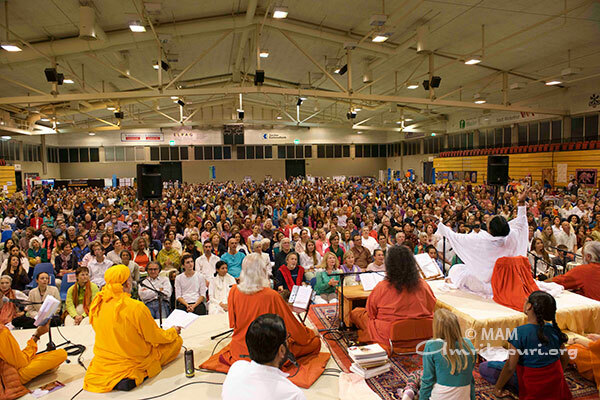 When she was 3 years old, she began writing and composing Bhagavan Sri Krishna’s songs and poems and by the time she was 5 years old she even started singing them. This is only because of the fact that she is not just a human being but a divine being. 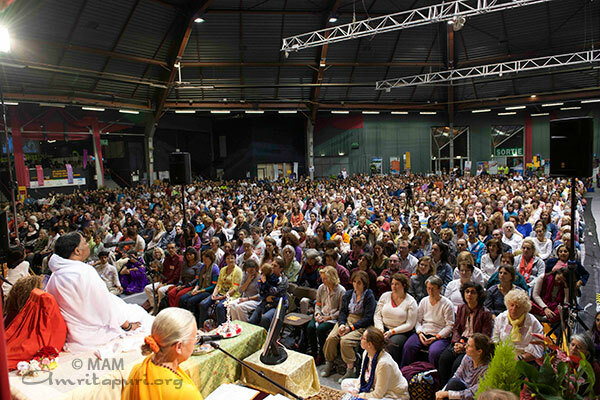 “Our Mother, ‘Amma’ had imbibed or absorbed the complete essence of Vedanta at a very tender age. 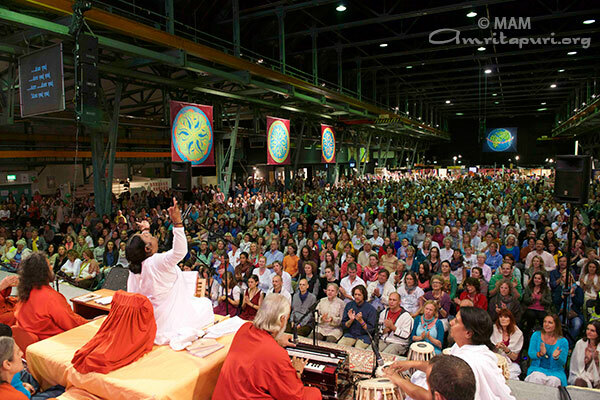 The ‘Moola Mantra‘ or the prime essence of Vedanta is, ‘yat pinde tat brahmande‘. 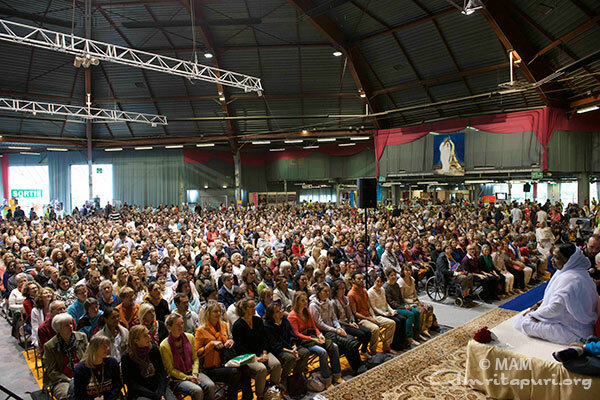 Which means “Everything in our body exists in the universe, everything in the small exists in the big, and everything in me is in you”. Amma lives this philosophy. “My prime concern as the Home Minister of India, is about the terrorism, extremism, insurgency problems and the violence that our country is facing. 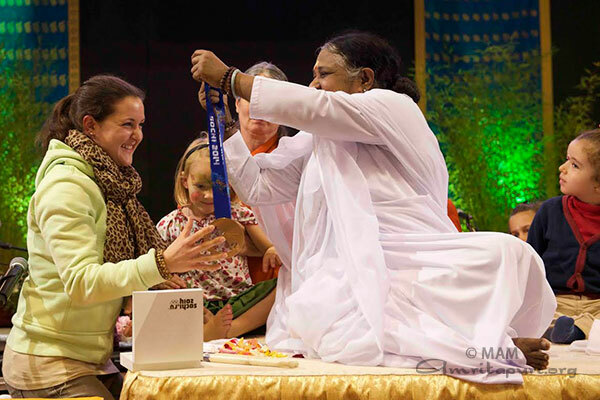 I honestly believe that we can get rid of and get relieved of this violence and terrorism through the grace and blessings of our divine mother Mata Amritanandamayi Devi. 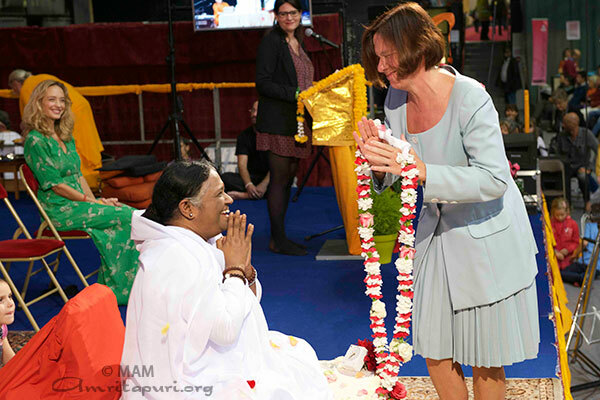 “Sisters and brothers, please believe that not only India which has Amma as the supreme divine power, but also the entire universe will experience supreme happiness, joy and prosperity. I also believe that Love, Compassion, Forgiveness and Selfless Service is the only cure for any type of hurt, wound or disease that exists in this world. 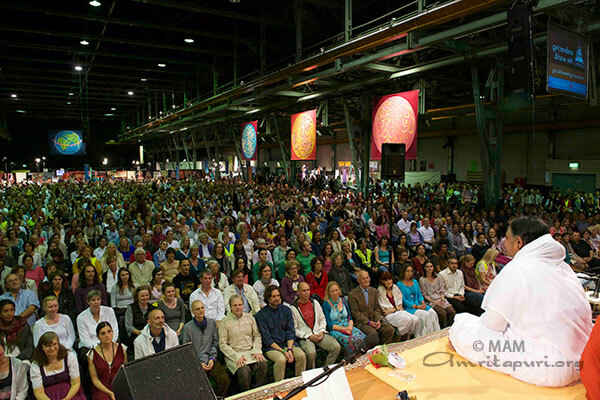 This is the message that Amma imparts to India and the entire world. 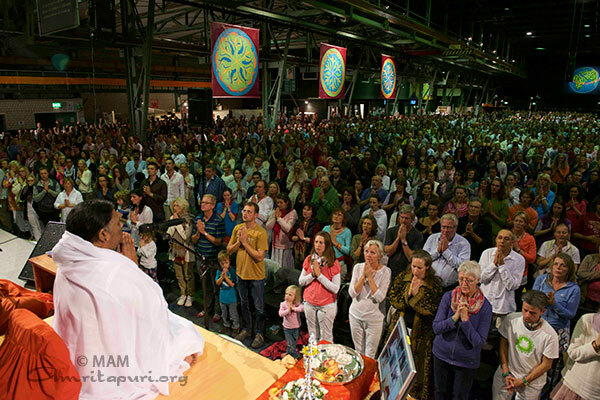 I strongly believe that through Amma’s blessings, India will not only become a super economic power but will also become a Super Spiritual Power. 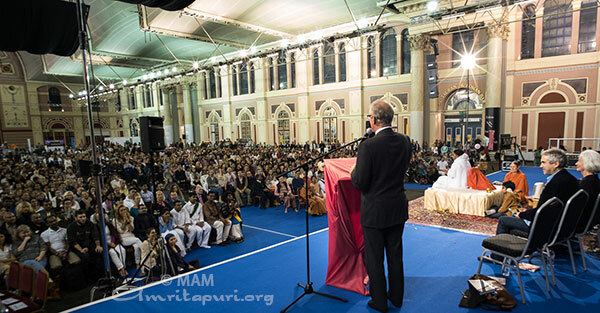 And that is when India will become the Spiritual Guru of the entire World and will also proudly say ‘The entire world is our family'”, said the minister amidst the thunderous applauds of the devotees. 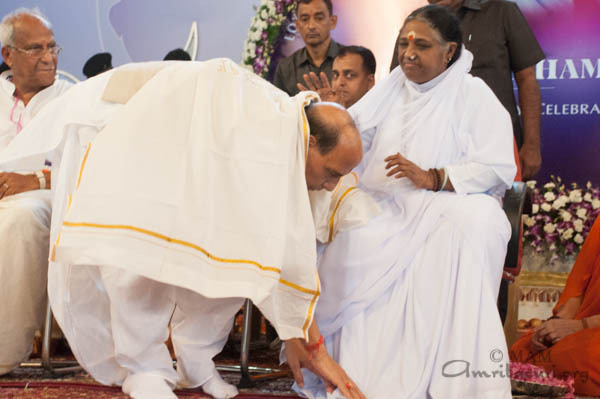 Before concluding his words, Rajnath Singhji offered his prayers to Amma in Malayalam which brought smiles to every one, the huge gathering of devotees at the cultural meet (Jayanthi Samelanam) organised on the occasion of the ‘Amritavarsham 61’ celebrations. Public hygiene and improved sanitation for its population is India’s newest priority; in order to achieve this goal, India aims to end open defecation by 2019. Moreover there is a lack of sanitation awareness in these communities that consequently arise in preventable diseases. 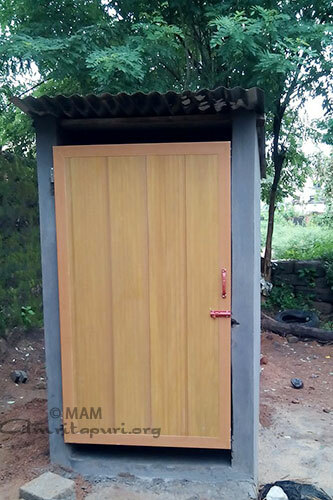 To address the problems of lack of toilets in the country, Ammachi Labs of Amrita University is rolling out vocational courses such as Masonry, Plumbing and Electrical Wiring through which women in villages are being taught construction, installation and maintenance of toilets. This project is creating ambassadors for women safety and hygiene. 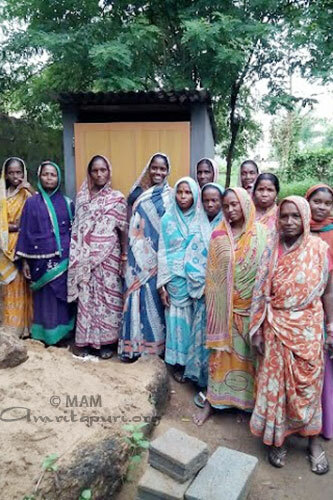 As part of the first phase of its latest project, 20 women in the village of Bhoi Sahi in Odisha have become agents of change and an inspiration for all women, having completed building fully functional toilets in their own homes. 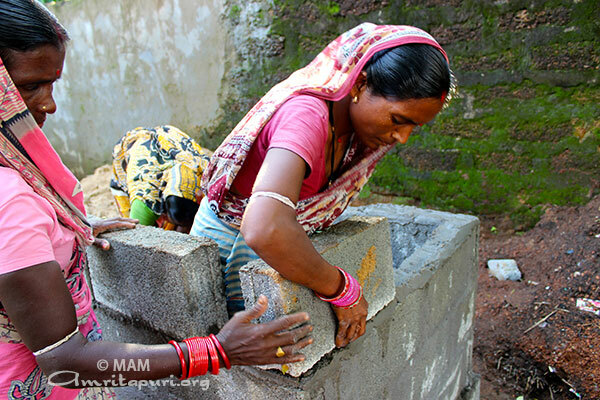 The women started building the toilets earlier this month and have completed 9 toilets with another 11 more on the way. Amma’s initiatives in empowering women have taken an innovative turn with the introduction of technology to deliver vocational education. 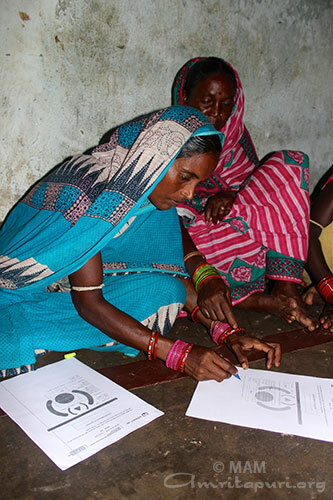 The Bhoi Sahi women are thrilled to acquire new skills and learn through computers. 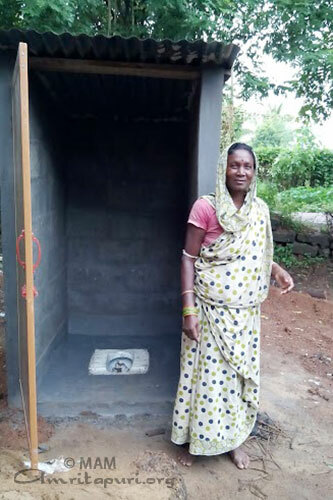 One of the students, Shantilata explained that currently the women travel one kilometer to relieve themselves in the field. Many of them travel there in the early mornings and late at nights to attain some sort of privacy. “It is quite brilliant what Amrita University is trying to do through this initiative – converting their most acute problem which is open defecation and lack of basic hygiene, into an opportunity to solve their immediate problems on ground as well as facilitating the increase in quality of life through skill development.”, quotes Sreeram, a field researcher at Ammachi Labs. Ammachi Labs has provided vocational training using technology to more than 4000 women from rural and tribal areas, to date. 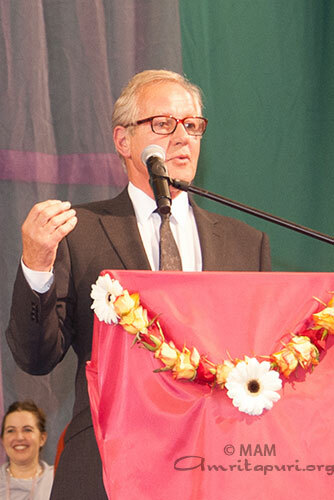 Ammachi Labs’ revolutionary approach strives to achieve economic and social empowerment by using computerised vocational education training (cVET). The lab has developed Life Enrichment Education (LEE) courses to address existing social issues in the communities and practical training to support these women in acquiring new skills, we ensure each student enjoys a holistic experience. LEE awareness workshops were conducted and activities on hygiene, and have plans to deliver gender equality, human rights, and financial literacy modules to enhance their current understanding. 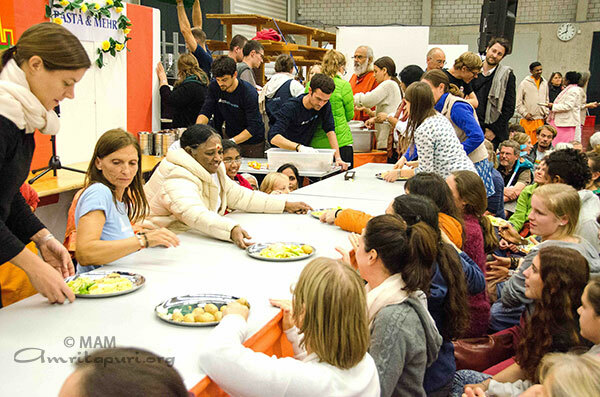 With time, leaders emerged from the group of women who showed increasing amounts of initiative to sustain this project. 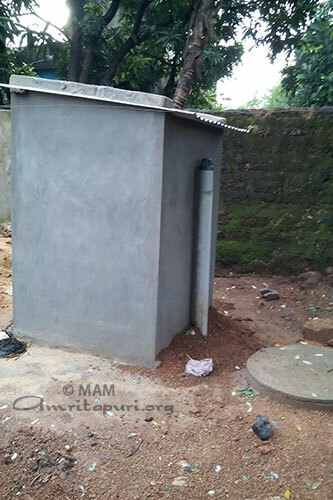 “With these new toilets, many expressed that they would feel safer and feel better about themselves; they see the short term rewards of having a toilet while reaping long term benefits for attaining a skill that they can generate an income for themselves and ensure the health of their families. 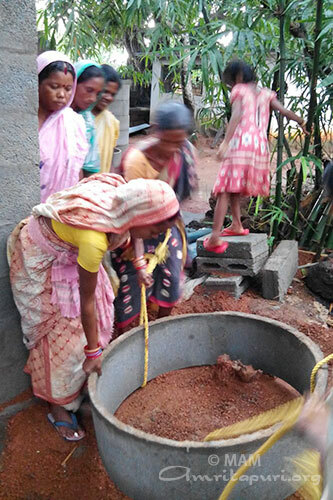 It is our goal for these ladies that upon completion of the project, they form a women’s cooperative and receive support from one another” said Prof. R. Bhavani Rao, Director of Ammachi Labs. Inspired by this Vishnu Prasad, the Sarpanch of Bhoisaahi came as a testament of his support for the project. 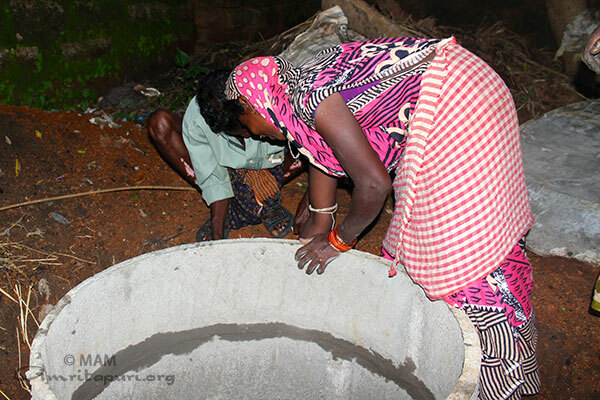 He has sanctioned these women to construct 3,000 toilets for 10,000 Rs per toilet. 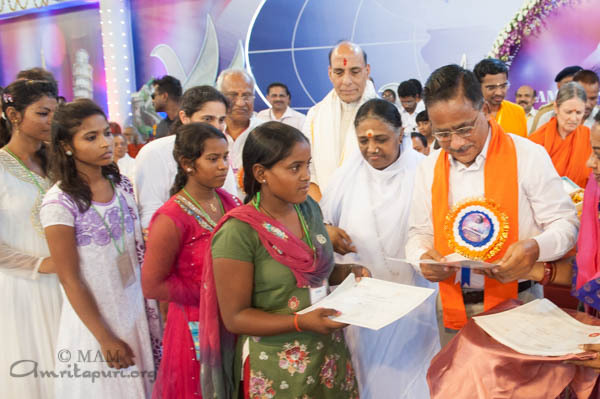 Amma’s initiatives in empowering women have taken an innovative turn with the introduction of technology to deliver vocational education with, more than 2,000 women have been trained in the last year alone through 33 centers in 12 Indian states. 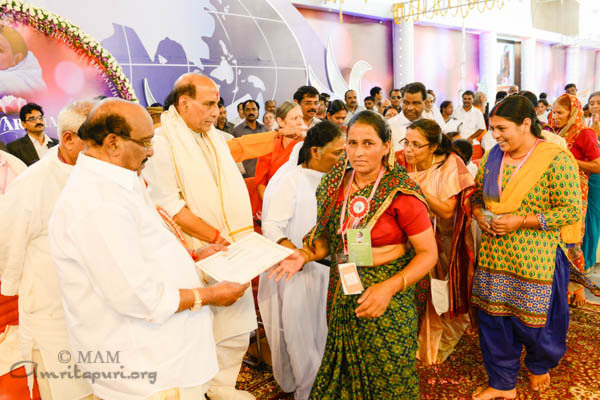 During Amritavarsham61, Radha Mohandas Agarwal, Chief Whip, UP and Vellappilly Natesan gave away certificates of completion to graduates in such fields as plumbing, nursing, masonry and jewelry-making. 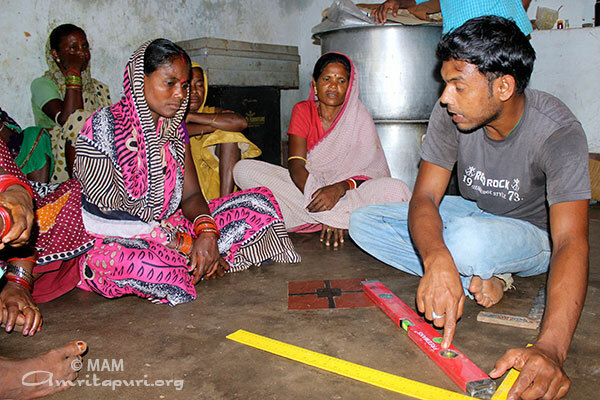 Vocational-training is an important part of the MAM’s Amrita SeRVe village-empowerment program. AMMACHI Lab’s Heartfelt Arts empowers women artisans and cooperatives to leverage their newly learned skills into creating beautiful handicrafts and products that generate sustainable income for their communities. In attendance, are hundreds of women artisans from 16 centers across India. On this occassion, Vellapally Natesan, General Secretary of the SNDP launched a new website www.heartfeltarts.com where they will be able to showcase their handicrafts.